BALTIMORE (AP) -- Antonio Hammond is the $18,000 man. He's a success story for Catholic Charities of Baltimore, one of a multitude of organizations trying to haul people out of poverty in this Maryland port city where one of four residents is considered poor by U.S. government standards. Hammond says he ended up in Baltimore three years ago, addicted to crack cocaine and snorting heroin, living in abandoned buildings where "the rats were fierce," and financing his addiction by breaking into cars and stealing copper pipes out of crumbing structures. 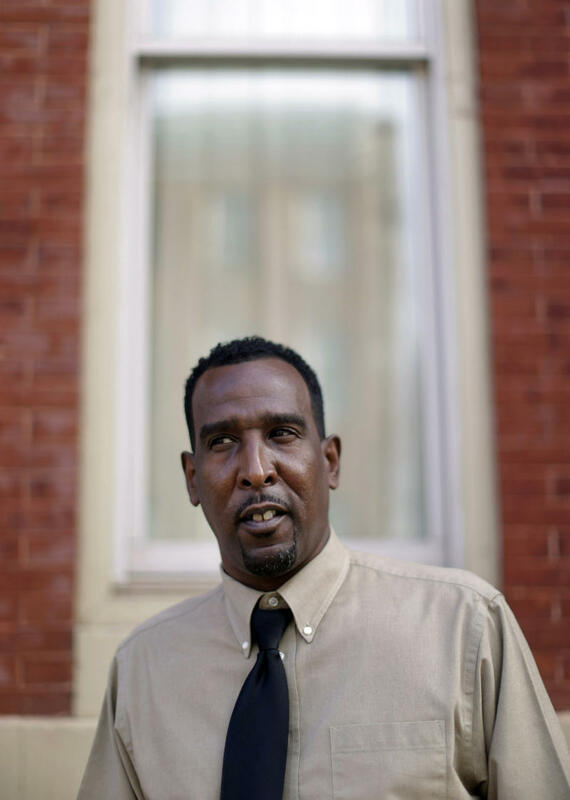 Eighteen months after finding his way to Catholic Charities via a rehabilitation center, the 49-year-old Philadelphia native is back in the work force, clean of drugs, earning $13 an hour cleaning laboratories for the Biotech Institute of Maryland and paying taxes. Catholic Charities, which runs a number of federally funded programs, spent $18,000 from privately donated funds to turn around Hammond's life through the organization's Christopher's Place program which provides housing and support services to recovering addicts and former prisoners. Such success stories are in danger as $85 billion in federal government spending cuts begin squeezing services for the poor nationwide. The cuts started kicking in automatically on March 1 after feuding Democrats and Republicans failed to agree on a better plan for addressing the national deficit. They are hitting at a time of spiking poverty as the U.S. slowly climbs out of the deepest economic downturn since the Great Depression of the 1930s. "All I wanted to do was get high," Hammond said. "I didn't even know any more how to eat or clean myself." Now he lives with two other men in housing subsidized by the charity, got his driver's license and bought a car. What he marvels at the most is that he has been accepted after a 20-year absence by some of his nine children. That's the best part, he said. "At least I know now they might not hate me." The U.S. Census Bureau puts the number of Americans in poverty at levels not seen since the mid-1960s when President Lyndon B. Johnson launched the federal government's so-called War on Poverty. As President Barack Obama began his second term in January, nearly 50 million Americans — one in six — were living below the income line that defines poverty, according to the bureau. A family of four that earns less than $23,021 a year is listed as living in poverty. The bureau said 20 percent of the country's children are poor. Although it is far from the country's poorest city, Baltimore's poverty rate far outstrips the national average of one in six. Catholic Charities of Baltimore is a conduit for state and federal money for programs designed to help the poor. The charity plays a major role in administering Head Start, a federal program that provides educational services for low-income pre-school children and frees single mothers to find work without the huge expense of childcare. The spending cuts, known as the sequester, are going to hit Head Start especially hard. "Before the sequester only half of the need was being met. Now, after the cuts fully take effect, there will be 900 children already in the program who won't be able to take part," said William McCarthy, executive director of Catholic Charities. There is no question the national belt-tightening "will deepen and increase poverty," said McCarthy, citing the cuts in long-term care for poor seniors including assisted living and nursing care, and fewer low-income housing spaces, among other ripple effects. Under the spending cuts, Baltimore Housing Commissioner Paul T. Graziano said his agency faces a $25 million shortfall in funds to help poor people with housing. There are 35,000 people on the waiting list. He also lamented cuts that will hamper the city's efforts to clean up or demolish blighted neighborhoods. Baltimore has 15,000 vacant and abandoned structures as a result of a steep population decline over the past half century. "It's very, very disheartening. We take a couple of steps forward and then fall back at least one. The private sector isn't going to fix these neighborhoods. I view these things as investments, not expenditures. These things are an investment in the future that bring returns many times over," he said. While the U.S. economy is slowly recovering, improvements for those deep in poverty do not keep pace with the cuts now in place. The spending reductions going into effect will hit hardest at Americans whose prospects are not directly tied to the economy — people like Antonio Hammond and children in the Head Start pre-school programs. Mayor Stephanie Rawlings-Blake said Baltimore depends on federal grants and funding for 12 percent of its budget. The austerity cuts "to housing programs_as well as those to public safety, health, and education_will have an adverse effect on Baltimore and throughout the country," she said. The cuts, which will also hit U.S. defense spending, were designed two years ago as an incentive for lawmakers to avoid a standoff over the federal debt and a potential government shutdown. The measures were seen as so onerous as to force Republicans and Democrats in Congress to reach a compromise spending plan. But compromise proved impossible before the March 1 deadline, and what were once seen as unthinkable cuts automatically went into effect. Democrats want a deficit reduction plan that includes some spending cuts and tax increases on the wealthy. Republicans balk at any more tax increases and insist the problem should be addressed solely by reigning in spending. That feud continues as the two sides battle out future fiscal issues. Republicans want to see even more cuts in next year's budget, reductions that would, by and large, return military spending to pre-sequester levels and provide big tax benefits to wealthy Americans. A 2014 budget plan proposed by Rep. Paul Ryan, the vice presidential candidate on the unsuccessful Republican presidential ticket last year, would be particularly tough on social safety net programs. His plan would slash $135 billion over the next decade from the program that provides food aid for low-income Americans. Nearly three-quarters of households receiving help from the program include children, who, census figures show, are the group hardest hit by poverty. Ryan's plan would also turn the government's Medicare health insurance program for Americans age 65 and over into a voucher system, providing direct government payments to seniors who would then try to buy insurance on the private market. Ryan defends his drive for austerity as necessary to begin shrinking the country's $16 trillion national debt. "If we never balance the budget, if we keep adding deficit upon deficit we have a debt crisis like Europe has. That means seniors lose their health care benefit, that means the people in the safety net see the net cut and they go in the street. That means you have a recession. These are the things we prevent from happening by balancing the budget. Balancing the budget is but a means to an end. It's growing the economy, it's creating opportunity, it's getting government to live within its means," he said in an interview with Fox News. Obama backs increasing taxes on the wealthy while instituting smaller government spending cuts, a plan that would reduce deficit spending but more slowly. He and most fellow Democrats argue that European-style austerity has not worked there and will harm the U.S. recovery from the Great Recession. It's an ideological fight that dates back decades. Republicans work from the premise that by unleashing the private sector and removing government controls, all Americans will prosper along with the economy and benefits will flow down to lower-income earners. Democrats insist there is an essential role for government in putting a floor under the poor and helping local governments with problems that the private sector cannot or will not shoulder. Some worry the gap between rich and poor in the U.S. will keep widening under the austerity measures. According to a report by the non-partisan Congressional Research Service late last year, "U.S. income distribution appears to be among the most unequal of all major industrialized countries and the United States appears to be among the nations experiencing the greatest increases in measures of income." Mary Anne O'Donnell, director of community services at Catholic Charities of Baltimore, said increasing income inequality has shown itself dramatically during the U.S. downturn. "In the last three years, there's been a great change in the kinds of people we are serving. There are increasing numbers of people who owned a home, lost their jobs, end up living in their car and are coming with children to our soup kitchen," she said. Her organization spent $126 million in the last fiscal year feeding the poor, helping them find jobs and housing, running nursing homes and putting men like Hammond back on their feet. Of that figure, $98 million came from various programs funded by the city, state and federal governments. Those now face the big cuts as politicians in Washington fail to find a compromise.